Two years ago, Russia’s opposition movement was in full swing as a series of street protests across the country drew huge crowds of people dissatisfied with the rule of Vladimir Putin. But amid infighting among opposition factions and a state crackdown on public protests, the group appeared to lose its way. And as public backing for Putin’s stance on Ukraine has swelled, the opposition has become increasingly marginalized. Two years have now passed since the March of Millions in Moscow on May 6, 2012, when thousands of people gathered to protest against Vladimir Putin on the eve of his inauguration as president, resulting in a violent confrontation between protesters and police. A legal process unprecedented in post-Soviet Russian history, dubbed “The Bolotnaya Case”, was initiated after the March of Millions. Although an independent international commission that included Amnesty International and Human Rights Watch came to the conclusion that “the violence and disruption of order were largely caused by the actions of the authorities and especially by the police,” only protest participants faced legal repercussions, with 27 people seeing charges pressed against them by the state. The evidence presented in the charges varied. Some protesters were accused of throwing chunks of asphalt, others of “pushing” police officers, and one was even charged with knocking over portable toilets. Twenty-three-year-old Yaroslav Belousov was sentenced to two and a half years in prison based solely on police testimony and a video that showed him throwing a lemon into the crowd. On February 24, 2014, another six people were sentenced to serve between two and a half and four years in prison. In addition to ordinary members of the protest, leaders of far-left organization The Left Front, Sergei Udaltsov and Leonid Razvozzhayev are currently waiting for a court verdict. The state pressed charges against them in October 2012, when a controversial documentary film called Anatomy of a Protest 2 was shown on state-run television channel NTV. The film, dismissed as “slander” by Udaltsov, proposed that Udaltsov and Razvozzhayev had collaborated with leftist activist Konstantin Lebedev and Georgian politician Givi Targamadze to create mass unrest and to seize power. Lebedev, whom members of the opposition now consider to be a traitor, pleaded guilty and struck a deal with the authorities, agreeing to testify against his former associates. He was sentenced to two and a half years in prison and was released after serving half his sentence. At the time, the opposition figurehead was already a defendant in another court case, in which a firm linked to Navalny and his brother was accused of defrauding French cosmetics company Yves Rocher to the tune of 27 million rubles ($753,000). Navalny is currently under house arrest and is not permitted to use the internet or telephone or to communicate with anyone other than family members and attorneys. The fact that Navalny was not taken into custody during the investigation is unusual in terms of Russian judicial practice, and experts theorize that this move is part of a campaign to discredit him. 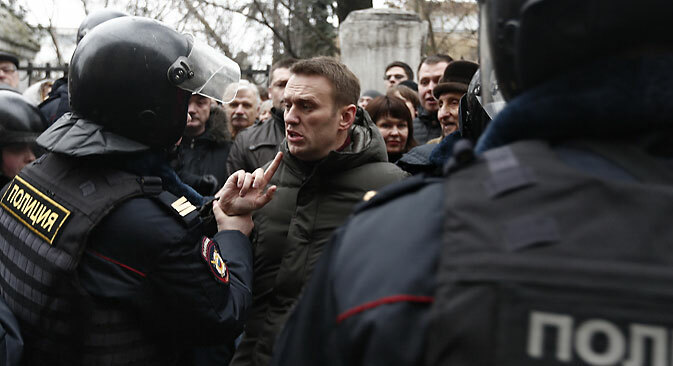 “In light of the Bolotnaya Case court rulings, the legal system’s leniency towards Navalny sets him apart from the protesters,” says Alexander Pozhalov from the Institute of Socio-Economic and Political Studies. The government has adopted a policy of toughening legislation, adding more requirements for protest organizers and increasing fines for alleged violations during rallies. According to the bill’s initiator Andrei Krasov, policy changes were necessary to restore order and to "ensure a quiet life for the rest of our citizens." On February 1, 2014, the government passed a law allowing the authorities to block internet resources that "call for mass disturbances." Vadim Ampelonsky, a representative of the Federal Service for Supervision of Communications, Information Technology, and Mass Media (Roskomnadzor), denies that the new law is directed against the opposition, stating that the bill was meant to combat "above all, extremism on the internet and calls for terrorist activity." "The reforms implemented over the past few years are designed to eradicate the phenomenon of non-systemic opposition and to include those who hold opposing points of view in the political system," explains Pozhalov. Sociologist and left-leaning publicist Boris Kagarlitsky tells the following story: "In response to the question ‘what will you do with the opposition?’, one high-ranking official told me something quite remarkable: ‘... we’ll put them somewhere, some in the Duma, others in prison ... we just haven’t figured out who is going where yet’." Yevgeny Roizman, an opposition candidate, managed to win last year's mayoral elections in Yekaterinburg, the fourth most populous city in Russia. "This is the essence of the experiment,” Kagarlitsky says. “Each player can be utilized in one of two ways. It’s just that the Duma option hasn’t been thoroughly thought through yet." Meanwhile, high-profile representatives of the opposition are downbeat about the movement’s future prospects in light of the developments of the last two years. "The opposition is not doing so well right now,” says Boris Nemtsov, one of the liberal left-wing leaders. “A lot of our comrades are behind bars, some people are wanted by the authorities, and some have emigrated." "The opposition has ceased to exist as an organized political force because there has been a separation of various political forces," says left-leaning politician and Duma official Ilya Ponomaryov. The Russian Opposition Coordination Council, established by representatives of various opposition groups in October 2012, fell apart just a year after its creation as its members fell into quarreling among themselves. “The numbers dropped off as the Kremlin launched a propaganda rhetoric campaign that stressed concepts such as ‘the hand of the West’ and ‘foreign agents’ [non-profit organizations receiving funding from abroad were required to register as foreign agents – RBTH],” Gudkov says. “These Kremlin accusations neutralized the slogans put forth by the opposition. At some point, the public started listening to the Kremlin, and opinions gravitated toward the authorities." The situation is slightly different in Moscow, where the number of protest activities has always been higher. On March 15, 2014, an anti-war rally against Russian military intervention in Ukraine drew 50,000 people, according to the organizers. Another factor in the decline of public backing for opposition groups is the country’s official position regarding the crisis in Ukraine, which enjoys widespread support among the Russian population and witnessed Putin’s popularity ratings soar following the takeover of Crimea. "Only about 7 percent of the population feels shame and indignation when it comes to the actions of the Russian authorities,” Gudkov explains. “A lot of people who had previously sympathized with the opposition now endorse Kremlin policies." Those who oppose Russia’s intervention in Ukraine are up against majority opinion, and an increase in public activity from opposition groups is not expected in the near future. “As far as I can see, the most reasonable part of the liberal opposition is more likely to concentrate on culture and ideology, and is not expecting much of a political effect in the near future,” says political analyst Mark Urnov.